Montreal, Quebec (Canada) -- Diane Du Cap remembers how difficult her work life was before she learned to meditate. "I was negative and reactive at work, always jumping into an aggressive defence mode," she said. << Stephen Schettini, a former Buddhist monk, teaches meditation to busy, stressed-out careerists. A sourcing production manager at Adorable Lingerie Inc., Du Cap has spent the past 26 years working in the needle trade, an industry that's well known as a high-pressure environment. "I realized that something was wrong while I was at a concert of the Montreal Symphony Orchestra," she said. "I had season tickets and I realized that every time I went, my concentration was so bad, I wasn't hearing the music. I also wasn't sleeping well. And my mind was working non-stop, always thinking of work." Du Cap considered quitting her job. "I made a list of pros and cons, and realized I loved my job and I started to see why I loved it. I also realized this was not about my boss, my job, the environment or the other employees. It was me." That epiphany sent Du Cap to one of Stephen Schettini's meditation courses in Pointe Claire. Schettini, 53, a former Buddhist monk who lives in Hudson, teaches busy, overstimulated careerists like Du Cap how to quiet their minds through meditation, which in turn increases their effectiveness in the workplace. No longer the counter-culture activity it was during the 1960s, meditation is mainstream and is being embraced by busy people who, like Du Cap, want to learn how to juggle all the sectors of their lives with equanimity. "They want to get some control over their lives," Schettini said of his students. "They can't manage work and home, with the BlackBerrys going off all the time. And they don't know how to turn into the self-possessed, creative, emotionally intelligent people they want to be." 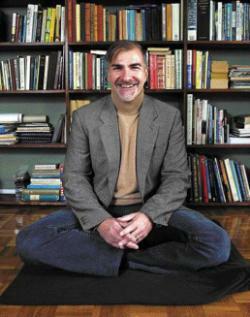 Schettini began teaching meditation four years ago in Hudson. "I rented a church hall and put an ad in the Hudson Gazette," he said. "The hall filled up with 35 people on the first night. So I started teaching one class a week. I was teaching Buddhist concepts." Which brings us to the fascinating story that is Stephen Schettini's life and which mirrors the often-tumultuous history of the baby boom search for enlightenment. After growing up in England and attending a private Roman Catholic school, Schettini studied social sciences under Marxist professors at the University of London. "It was a radical place and the big choice was whether to become a Trotskyist or a Maoist," he recalled, adding that he became as disenchanted with political ideology as he had with his Catholic indoctrination. Shortly after graduation in 1974, he hitchhiked to India, travelling through the sub-continent in addition to Pakistan and Afghanistan. "I immersed myself in Buddhism and mysticism," he said, adding that his travels took him to Dharamsala in northwest India, where he studied Buddhism with exiled Tibetans. He took a sojourn to Nepal for meditation courses before returning penniless to England, where he worked in his father's restaurant. Schettini knew he had found what he calls "a path" and by 1975, he had become one of a handful of Westerners admitted to a Buddhist monastery set up by Tibetans in Switzerland to train monks who would teach Buddhism to Westerners. "I had to learn Tibetan," Schettini said. "And eventually I was ordained and was teaching." What followed was almost a decade during which he lived a disciplined life, mostly in Tibet, until, he said, "I could no longer hide from my Western upbringing and had come to realize that the language in which I'd learned Buddhism was not appropriate for Westerners. It was not just a question of translating words but of translating culture." He left the monastery in 1983. "It was worse than a divorce," Schettini said. After teaching English as a second language in Switzerland, he immigrated to Canada on the advice of a friend who lived in Montreal. In the past 22 years, Schettini has forged a career doing graphic design, typography, technical writing and Web communications. But he began teaching meditation after he began writing his memoir. He has created a website (www.thequietmind.org) to market his services to companies that want to offer on-site meditation programs to their employees. On a recent rainy evening, he sat cross-legged on the floor of a candle-lit yoga studio in Pointe Claire, talking to the 25 people who have become his students. There are several sessions during each 90-minute class when everyone meditates for a few minutes. Then Schettini, an erudite man who exudes, not surprisingly, an aura of worldly tranquility, talks to them about the essence of meditation, how it works to quieten what he calls "the discursive mind." He also tells them that stress is not an external object, but the human response to certain stimuli. "There is a split second between when a stimulus occurs and when we react to it. That period of time is meditation," he said. He wants his students to use meditation as a tool to allow them to stand outside of their minds, watching. He talks to them about being in the present moment, in a state of "mindfulness." He tells them that what human beings must understand is that life is short and fragile, and that everything constantly changes. He laments the fact that the "mental disquiet" and spiritual paucity in the West is overwhelming. And he gives them homework. For the following week, he instructs them, they are to remember each time they look at their watches to stop and take three deep breaths. It is these messages and the new ability to quieten herself through daily meditation that Diane Du Cap has taken to her workplace, and they've helped her transform her work experience from stressful to joyful. Arthur Baylis, a product development manager at EMS Technologies Inc., started taking Schettini's courses a year and a half ago. "I was feeling stressed by work and personal commitments," said the father of two. "I would work out at the gym and run several times a week, but it wasn't enough. I was looking for something that would bring me peace." He said that after meditating for 10 minutes each morning, he's better prepared to deal with day-to-day stresses. "I have some interest in Buddhism and Tibetan culture," he said. "I've been to Nepal twice. Stephen puts a Western spin on it." Victoria Jonas, senior regional manager of investment products for Franklin Templeton Investment, said her life is often a blur of visits to clients and the ferrying of children to arenas and schools. She needed an antidote and enrolled in the course. "It makes you see things in a clearer way and you feel more able to tackle whatever comes your way," she said. Schettini dispels the notion to his students that meditation is about avoiding the world. "In fact, it's about being very much in the world," he said. "I want people at work, making money, creating families and being happy. "So many people hate their jobs and despise themselves for doing them. If I can get people to bring creativity and flow to their work or have the power to change, I'll have accomplished something."